They had explored every avenue, and it seemed that murder was their only salvation. Reggie and Midge, genteel husband and wife who live in what was the family’s more or less stately home, are now the reluctant managers of Chortlesby Manor Hotel, an English country inn of no particular distinction. But even this transformation will not solve their financial problems. 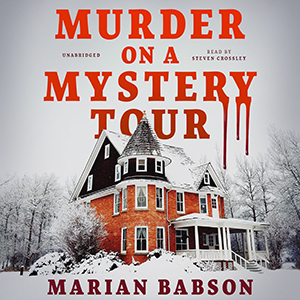 The possibility of succor comes instead in a transatlantic phone call from Midge’s old classmate, Victoria, who is arranging “mystery tours” of the English countryside for American visitors and wants to use Chortlesby Manor as one of the locales of her staged murders. From the beginning, the mystery tour project is heading for disaster. Dissension, complaints, and shows of temperament abound. These are upstaged, however, by a snowstorm of paralyzing amplitude, which in turn is upstaged when a real murder takes front and center. As a killer stalks this group of amateur sleuths on holiday, solving murders is no longer fun and games. Too many guests are checking out early from this eerie old English mansion. They’re not settling their bills—or leaving enough useful clues. A good book that is very well narrated, definitely worth a listen if you enjoy the style of classic mystery novels.